Jailed Manipur journalist Kishorchandra Wangkhem’s wife Ranjita Elangbam on Tuesday appealed for immediate release of Wangkhem, who has been arrested under NSA. Elangbam made the appeal while addressing a press conference in New Delhi. 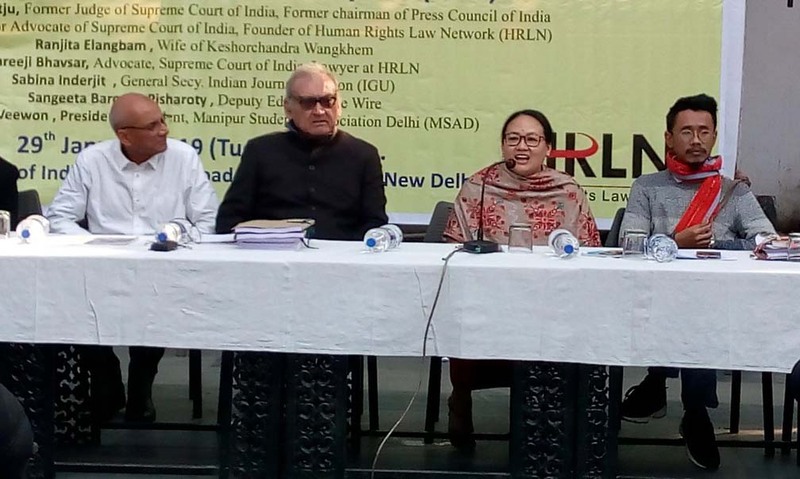 The press conference was steered by former Supreme Court judge and ex-chairman of Press Council of India (PCI) Markandey Katju, and senior Supreme Court advocate and founder of Human Rights Law Network (HRLN), Colin Gonsalves, reportsthe quint. Kishorchandra Wangkhem, who was working as an anchor with a news channel, was arrested on November 20 last year by Imphal West Police after he uploaded a video criticising the BJP-led Manipur government for observing Rani of Jhansi’s birth anniversary in Imphal. He reportedly used abusive words against the Manipur government and RSS and called Manipur CM a ‘puppet’ of Prime Minister Narendra Modi. Though he was released on bail on November 26 by the Chief Judicial Magistrate of Imphal West, Wangkhem was later re-arrested on November 27 and on December 14, the state government issued an order to detain the journalist under the NSA for one year following the approval of the NSA advisory board. In January this year, All India Congress Committee (AICC) president Rahul Gandhi wrote a letter to Wangkhem where he said, “this is another attempt to use the state machinery to silence dissent”.